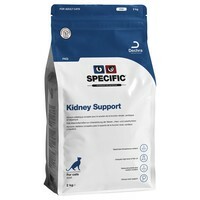 Specific Kidney Support FKD Dry Food for Adult Cats is a complete diet designed to provide nutritional support for cats with reduced heart, kidney and/or liver function. Developed with high levels of Omega-3, reduced protein and carefully balanced vitamins and minerals, the diet will help to support blood pressure and reduce the workload of your cat’s kidneys. A low sodium level also helps avoid water retention, which is vital for kidney, liver and heart patients. Specific Kidney Support also has a restricted protein level to protect against the formation of urinary crystals and stones. Maize, Maize Protein, Pork Fat, Fish Oil, Egg Powder, Potato Protein, Maize Starch, Cellulose Powder, Animal Protein Hydrolysate, Beet Pulp, Minerals (including Tri-potassium Citrate), Vitamins and Trace Elements (including Chelated Trace Elements), Antarctic Krill, Fish Meal, Taurine, Psyllium Husk, Tryptophan, Lysine, L-Carnitine. This product is excellent as my usually fussy cat loves it and her kidney health has improved so much she is like a kitten again. Thank you so much. 5 stars. My cat wouldn't eat anything other than food which made him ill, until I tried this. Highly recommended, but expensive. I have switched to a similar Vet UK product which is cheaper and has more product. Hopefully it will work as well. Unfortunately this product made my cat vomit and I had to discontinue it.